The Chloe Faye Bag Collection is rising in the world of fashion. Fashion-obsessed just loved the design and the uniqueness that sets them apart. And you should also know that this Chloe bag is quite affordable. The Wallet with Strap is basically the famous Wallet with Chain Bags but without the chain. Strap can be handy too, they are sometimes much more comfortable. And if you have met with Faye Bag before, you can see that there are a lot of similarities in this Chloe Faye Wallet with Strap. Like the oversized hoop that is linked to a golden chain and is connected to the side of the bag. This oversized hoop is the signature of the Chloe Faye Bag Collection. Designed with an fold-over-flap, the bag opens with a magnetic button closure. The shoulder strap can be adjusted and worn cross body as well as on your shoulder. What’s more? It can also be detached, so you can turn the bag into an evening pouch anytime you want. The interior is made with one large compartment to store all your evening items as well as three card slots. Measuring 7’ x 3.5’ x 1.5’ (W x H x D) inches, priced at $795 USD, €535 euro, $1280 AUD, ¥1940 JPY, $5850 HKD via Elyse Walker. Now that backpacks are the hot items for the new modern fashion, every designer wants to get into the game. Though there are plenty of gorgeous backpacks available, not all of them are worth the investment. But don’t worry, the Chloe Faye Backpack will definitely pass the fashion police test. Honestly, have you seen the original Faye Bag? Oh my, that’s a real gorgeous bag. You see, the Faye is designed with an oversized hoop in the center front; it’s also beautifully refined with shiny hardware. Then a hoop is linked with a chain to the side. And now take a look at the Chloe Faye Backpack, the same-effect right? 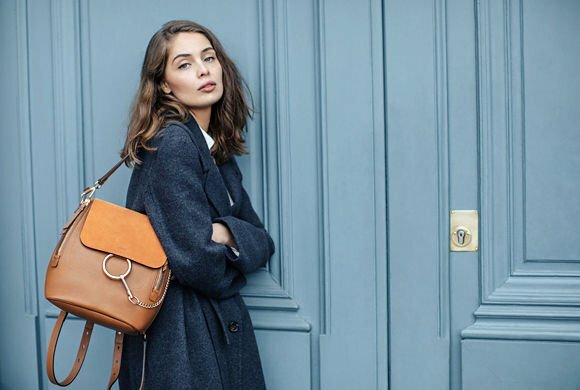 A Chloe Faye Backpack cannot be compared to other backpacks. It has its own personality. It’s chic, feminine and functional. By the way, the brand’s signature is gentle embellished on the front flap. Crafted from calf leather, it features zipped sides with adjustable width. The top is made with a top handle as well as adjustable shoulder strap. The interior also comes with a slot pocket. Available via MyTheresa. Chloe has picked up a lot of momentum in the bag world as of late. The Chloe Drew bag was possibly the “it” bag of the year of 2015, and we’re only expecting more greatness from here. The Chloe Faye bag first popped on the scene in the Spring/Summer 2015 collection. Since then, we’ve been seeing a lot more of the bag on celebs, bloggers, and cult followers. The most notable characteristic about the Faye bag is its sleekness. From afar, the bag looks almost completely flat with razor thin edges. PurseBop can’t help but wonder how well the bag maintains its shape after being packed (or overpacked). The flap bag features a magnetic snap closure, but the chain and ring on the front aesthetically pull the whole bag together. The detachable leather strap allows for great versatility, and the bag can be carried as a shoulder bag, crossbody bag, or a clutch. The Faye bag comes in two sizes: small and medium. The small has a more rectangular shape,and the medium is slightly more angular and trapezoidal. Each size features interior compartments with a zip pocket in the medium version. The most popular style for the Faye is the suede/calfskin combination. However, the Faye Bag comes in many different colors and textures such as python, patent, and a material that resembles crocodile. In suede and leather, the medium Faye retails for $1950 and the small Faye retails for $1,390 via Barneys. Are you feeling Chloe’s chic and sleek vibe? For maximum style factor, choose no other than Chloe’s small Faye shoulder bag which has been in the fashion industry for over a year or so but is currently making big waves for its beautifully crafted design. Perfect for women who are looking for a small purse/ hand bag, Faye will not disappoint with its fresh, crisp and bold colors that will add a touch of color to your monotonous and monochromatic outfits. Take it with you on your romantic first date at the cinema or at the park, this bag will hint your guy that you have a high-caliber taste when it comes to fashion. Simple, minimalistic yet elegant, Faye remains true to its classic and timeless appeal as this time it comes in a smaller version (previously there were only medium-sized Faye bags). Here are the features of this bag that will convince you to purchase one: pure authentic calf and lamb leather combined, smooth leather flap to the front, with prominent silver-tone loop and chain details, adjustable shoulder straps so that you can wear it cross-body, magnetic fastening, suede lining, two compartments, internal slot pocket for stowing your essentials in an organized fashion. Take things to a whole new level with this newest small version of the Faye bag and be in vogue! Measuring 6′ x 9.5′ x 2′ (H x W x D) inches, the small Faye shoulder bag costs around $1390 USD or €975 euro.